This unrealized urban plaza is part of The Dreaming, a larger catalytic and place-making initiative at the heart of Frederick, Maryland's Arts and Entertainment District. 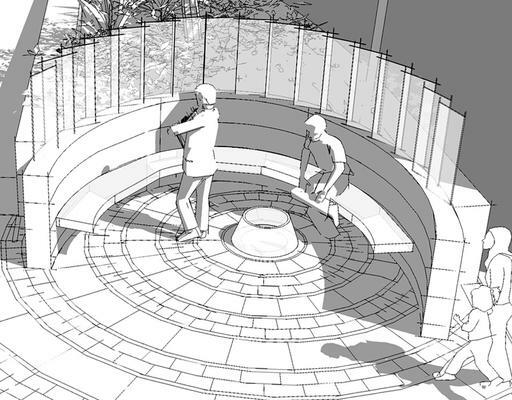 The curving open air stone bench is designed to foster conversation. A fan array of art glass panels etched with images and text explores the artistic history of Frederick and its old theater district. Viewers looking into the cast glass well head at the center of the exedra will see shining water running underground. Bronze bands bonded to glass and embedded in the plaza pavers radiate from the glass well. Thousands of letters cut through the bronze bands express dreams gathered from residents of all ages. The lettering illuminates the plaza at night. Designed by Cochran in collaboration with architect Jim Mills.